Is it baked oatmeal or is it a muffin? Let’s just call it the best of both worlds. Except these baked oatmeal muffin cups are made without any flour, refined sugar, or oil. So it’s the most saintly muffin you will ever eat. It may also be the easiest muffin you will ever make. This is an easy, one-bowl recipe that takes just minutes to prep. I have been making different varieties of these Apple Cinnamon Baked Oatmeal Muffin Cups since Luke was a baby. The last two times I made this blueberry version, he’s devoured them. The first time he ate six in one sitting and the second time he ate four. I figured I’d better share the recipe with you. I’ll only make double batches from now on! You can eat these with a fork or you can pick it up and eat it like a muffin. It can even go in the car with you if you’re having a busy morning! (We have plenty of those mornings.) There’s nothing better than a healthy, portable breakfast option. Go ahead, have your bowl of oatmeal to-go! These Blueberry Baked Oatmeal Cups are super quick to prepare and make a great healthy breakfast option! They are like oatmeal in portable muffin form! NO flour, NO oil, NO refined sugar! 1. Preheat your oven to 375 degrees. Grease a muffin tin and set aside. 2. In a large bowl, mix together the oats, baking powder, and salt. 3. Add the milk, egg, vanilla, maple syrup, and mashed banana and mix well. 4. Stir in the blueberries. 5. Fill each muffin cup to almost the top of the cup. Bake in the preheated oven 20-25 minutes, until the top is set. Less baking time yields a more creamy center (like baked oatmeal) and more baking time yields a more set center. I prefer them slightly undercooked because they are always totally firm by the second day anyway. great recipe! 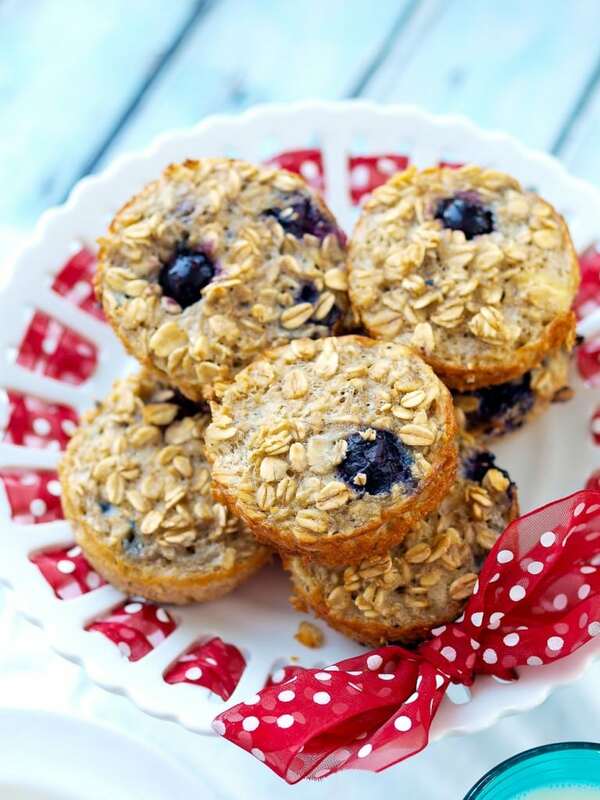 been looking around for muffin recipes with oats, this sounds so good! thanks for sharing! Any idea what the calories are per muffin? This looks so good! My son is allergic to eggs. Do you think making this with a flax egg would work? My poor son takes pancakes to daycare every day for breakfast (no eggs in them, of course). I’m thinking that this would be something different for him. I do think the flax egg would work! I *think* I have actually tried it, but not recently. Man-I think I still have pregnancy brain even 3 years after my youngest was born! haha! My daughter is allergic to eggs too and we sub 1/4 cup applesauce per one egg in muffin recipes all the time (though Ive never tried recipes that call for more than 2 eggs, so I can’t vouch for the quality there). The applesauce sub works beautifully. We’ve used Maryea’s banana pumpkin muffins with the applesauce sub a bunch of times if you’re looking for something different! Thanks, Maryea and Kristin! I will try using both and will also try the banana pumpkin muffins. Yum! I made these with a flax egg and they turned out great! I actually made blackberry muffins over the weekend and debated leaving the oats whole vs ground… I love changing up breakfast on the go! I have been loving baked oatmeal lately, and muffins are one of my very favorite things to bake. So I think it’s safe to assume that I’d love these! 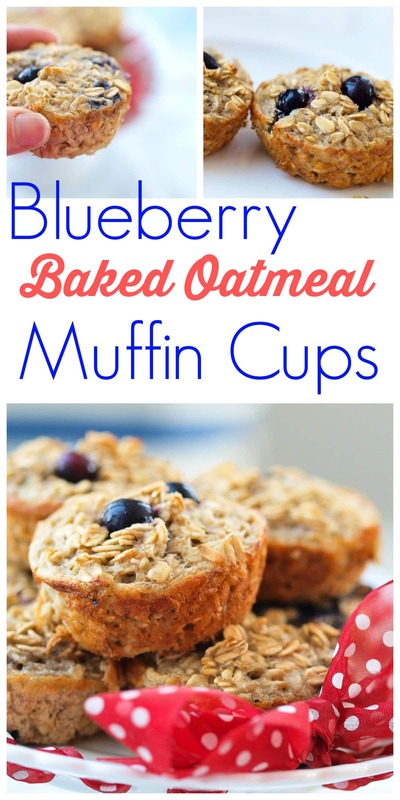 It would be so nice to have a batch of these baked oatmeal muffin cups in my freezer for quick breakfasts and snacks! Pinned! These would be so perfect for a quick breakfast!! Love it. We loved baked oatmeal – we’ll have to give this recipe a try! We make a lot of muffins at our house. 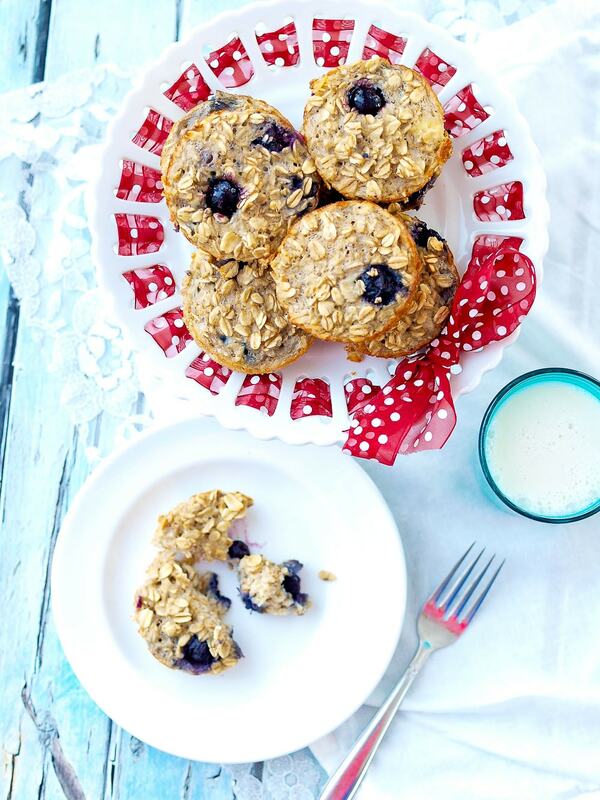 These look like ones we will have to try…a healthy twist on our regular blueberry muffins. Gorgeous! I’ll have to try those out! 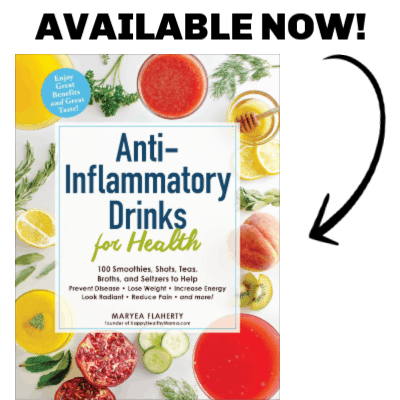 Thanks Kirtley–I hope you love these! Great recipe idea!! Just out of curiosity, do you use overly ripe bananas as you would for banana bread, or just “ripe”? Thanks! Either one works! The really ripe ones make them slightly sweeter, but I have used perfectly yellow ones and it’s been fine. Thank you! Can’t wait to try these and the apple ones!! YUM! Let me preface that I cannot cook NOR bake and these were the easiest muffins ever and I love them. Recipe is spot on and super easy! Cannot wait to make apple cinnamon ones!!! I will definitely use more of your recipes!! So long VitaTops! I’m really glad to hear it, MJ, thanks for letting me know! how many would be considered a serving? It really depends on your appetite and what else you are having with the meal. In general, I’d say 2 muffins equals a serving. Hello! I am making these right now and the mixture seems to be really watery, is that how it is supposed to be? My kiddos are anxious to try them in the morning and I am just hoping that I am making them correctly. Yes, the mixture should be somewhat loose/watery. Because these are baked oatmeal cups and not true muffins, they are softer than regular muffins when they first come out of the oven. After the leftovers are in the fridge they firm up more like regular muffins, but they are meant to be softer in the center like a baked oatmeal straight from the oven. I hope your kids enjoyed them! Hello, I was wondering if you store them in the fridge or in tupperware? Also how long do they keep? I don’t have kids, but I want to make them for me! The oven is preheating! I keep them in the fridge so they stay fresher. Ours are usually gone within 2 days, but I imagine these would last 4-5 days. I love these and change the fruit based on what I happen to have on hand (although I buy a LOT more blueberries lately). I make double batches on the weekends and freeze for the week. Thank you for the ideas. You’re welcome! I’m glad you’ve been enjoying these! Thanks for the delicious recipe. I bake the oatmeal in a square Corningware baking dish (the really old kind), I think is 8×8, or a small round casserole dish. if I put them in a muffin tin I only can fill about 9 and they come out different sizes. Would quick oats work instead of regular old fashioned? I only have quick oats. I think so. The texture will probably be slightly different and you may need to add a touch more milk. My only concern is that quick oats act more like flour and may absorb too much liquid. I do think it’ll probably work though! Did the quick oats work for you? I was trying to see if that would work. That’s all I have on me as well let me know ! Thank you!! I don’t use salt, and I add peanut butter, because bananas simply need chunky PB! Mine turn out harder, but I don’t mind munching on one on my way to work. Thank you, this recipe is perfect for me- simple and delicious! I think I answered this on Facebook, but in case anyone else is wondering I’ll answer it again. 🙂 You can try subbing applesauce for the banana and add some extra honey. Well thank you so much for taking the time to post a comment today! 🙂 I really appreciate the feedback. How many calories are in each muffin? My toddler loves these. I skip the maple syrup and he doesn’t know the difference. Thank you! My toddler and I love this recipe! I’ve made it many times! Lately I’ve been adding half a cup of coconut to make a thicker mixture. Delicious! I have been making these for the last few months. I love them. I take 3 for my breakfast. I use almond milk. I use 2 bananas. I can get 12 muffins. Thank you for this wonderful recipe.